Military & civilian pilots will exhibit their aviation skills during Friday’s "Thunder Over the Boardwalk"
Lightning fast aircraft will surely strike some attention for the Atlantic City Airshow Friday. Organizers expect to attract one million people to the beach and boardwalk to watch the annual display dubbed "Thunder Over the Boardwalk." World War II, civilian and military aircraft will glide through the skies as they perform gravity-defying feats, formation flying and solo routines for the 10th anniversary of the show. Planes will fly as high as 15,000 feet and as low as 50 feet above the water in front of the Atlantic City Boardwalk. The GEICO Skytypers performed a run-through of their team routine on Thursday. The five-hour show can be seen for free from pretty much anywhere in Atlantic City but exclusive seating (including a meal) is available for $30. The planes hit the sky starting at 10:30 a.m. 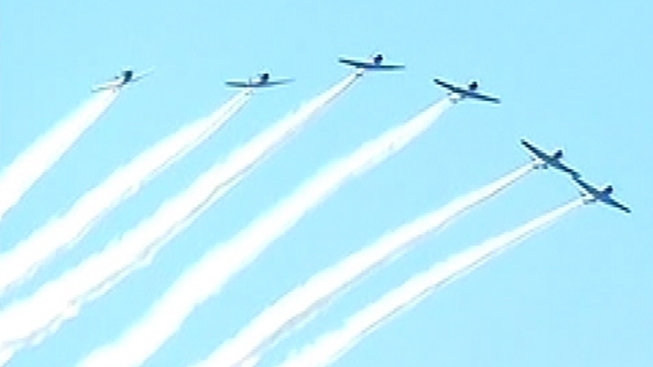 The 2011 A.C. Airshow brought an estimated 800,000 people to the shore.